This is my first ever Annie Sloan Chalk Paint Project! I attended the ASCP workshop a few years ago and purchased a can of the Antibes. It’s a really bright green and you guys know how I love bright colors. I used the ASCP Antibes on my bar stools. I think the bar stools are about 25 years old and they needed some up-dating. There is a bunch of junk on the bar because this photo wasn’t staged. These are the curtains hanging on the French Doors in our dining room area. I wanted to use a similar color and design on the bar stools. Although I use several different paint types, I have my favorites and usually go with one of those as my first option. But I decided it was time to see if the ASCP lived up to it’s billing. I bought a stencil at Hobby Lobby that had a little curvy detail. 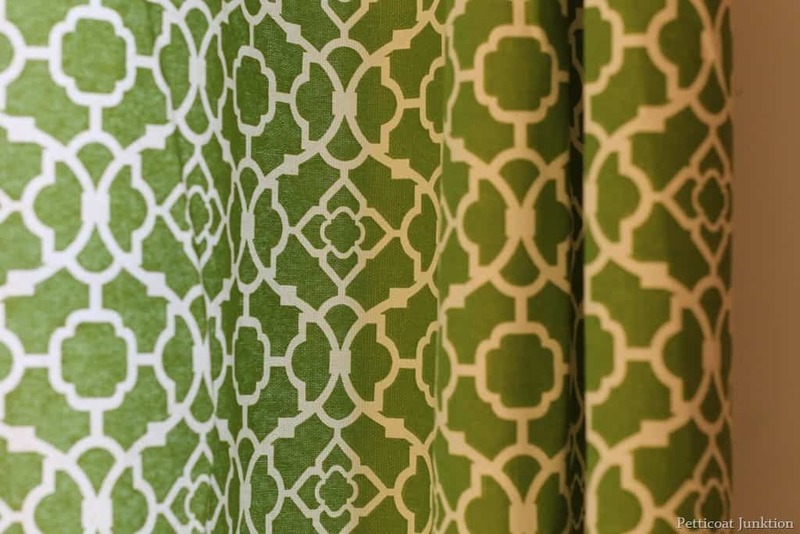 It isn’t the same Moroccan design as my curtains but it’s cute. I think the Moroccan design would be too big for the bar stool seats. I did a heavy distressing job on the stencil too. Do I like the paint color…yes. Is it the right color for my room…..no. 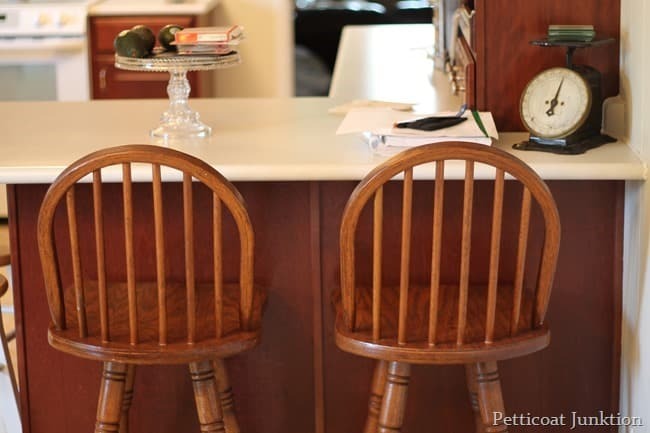 After looking at the bar stools for a few days, I’ve decided the color tone isn’t right. I need something really grassy green. So guess what? I’ll be repainting. Don’t know when yet or what color. Any suggestions on color or style? 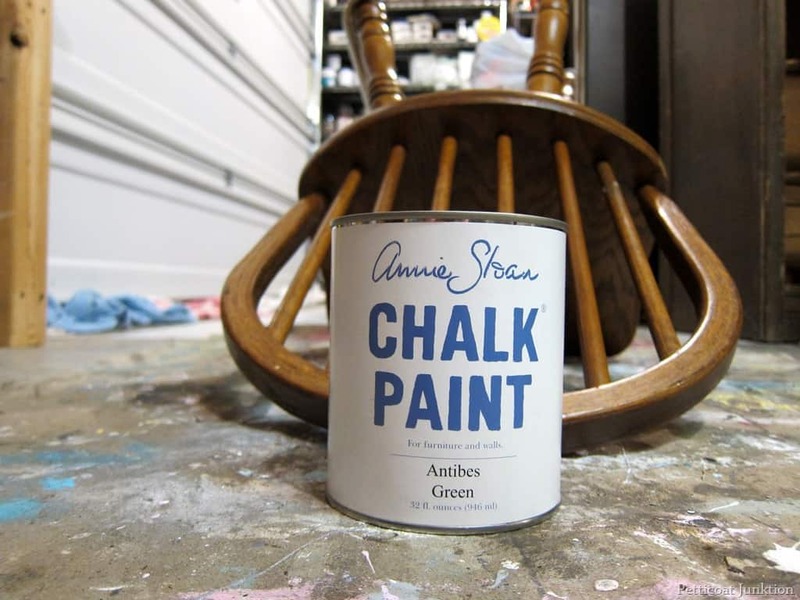 What did I think about the Annie Sloan Chalk Paint? I wasn’t impressed with the bonding… or lack of bonding to the wood and metal. The bar stools have a metal ring around the legs that supports and holds them in place. The chalk paint didn’t cover the metal well and when my small two year old granddaughter used the metal ring to climb up on the stool…some of the paint chipped right off. I’m not a big fan of waxing either. Too much work. You have to put a coat of wax on the paint to seal it. Will I give the paint another try. Sure. Maybe I just had bad luck all the way around with my bar stools! I do have a bar stool project I absolutely love. It just involved changing the fabric on the covered seat. 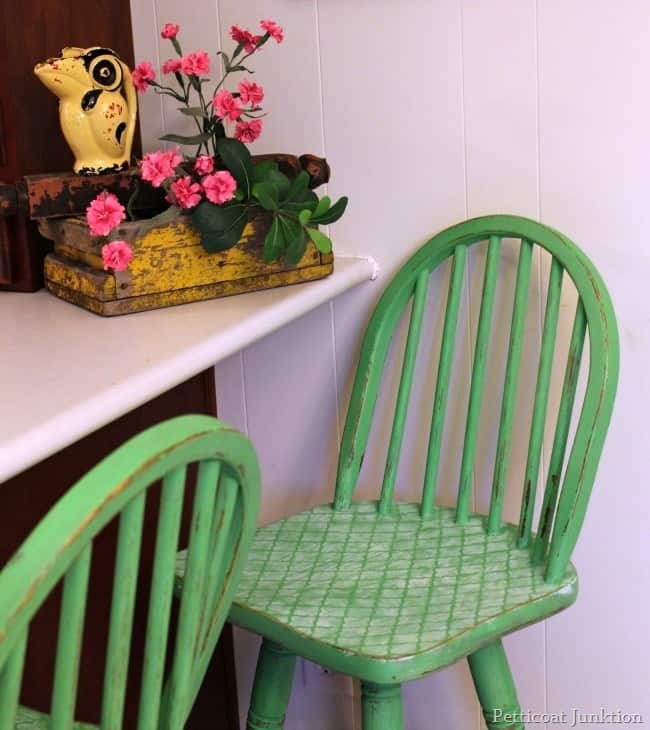 See it here…Cane Back Bar Stool. I love your green curtains! Do you know where you got them and the name of them? Thank you! I love Antibes green. I just did a piece with it and dark wax. LOVED IT. I think it is the white wax on your stools that is throwing it off? I love Anne Sloans paints, I have painted many of things that are metal, how long did you let it sit before using it? I have read most paints including annes take up to 30 days to cure. 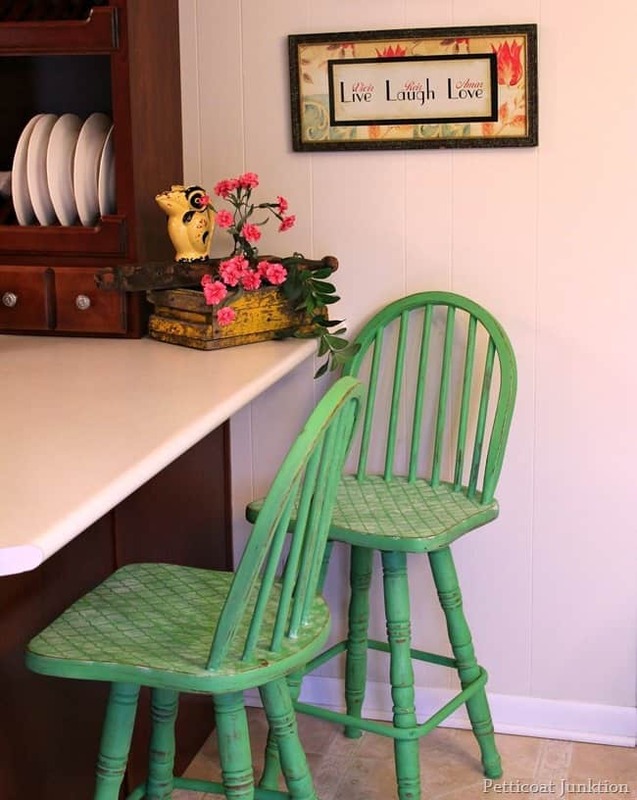 I use Annie Sloan Chalk paint and just loveit ! 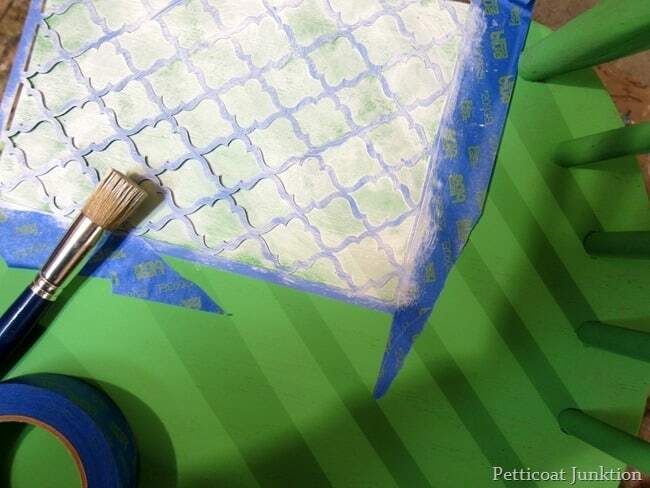 The important thing is to use acrylic glaze to seal it as you don’t have to only use the wax. I appreciate your honest review of AS paint. I can’t stand the texture of it until it’s waxed and I agree that the waxing is a lot of work. I hope you can find a paint color that you like. They look great Kathy, love the green! Me too about the waxing…it is sooo much work. I’ve never painted any metal, but the waxing is the part I don’t enjoy. 1st I love your work & your blog. 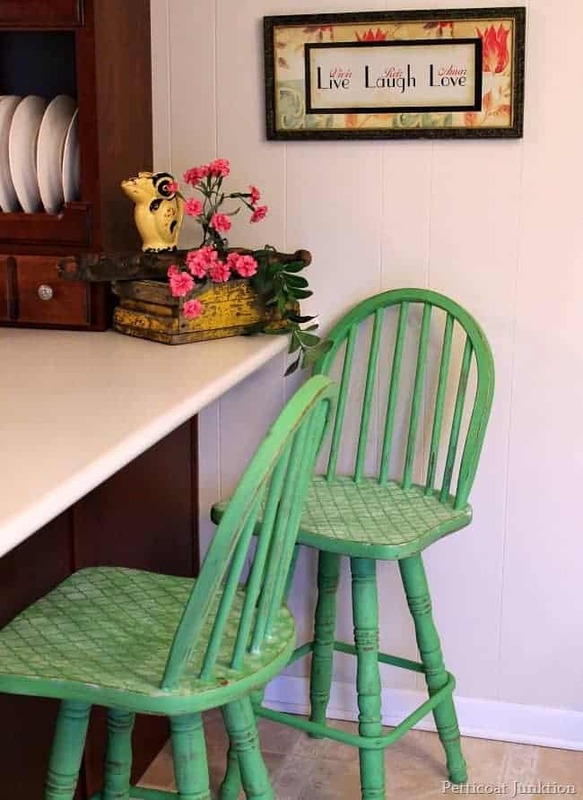 You should try Shabby Paints Antique Verde or Vintage Glass with their VAX. Its a wax & varnish in one. The most durable stuff ever. No sanding , no priming no buffing all VOC free & Eco friendly. Such a great project! So, what IS your favorite paint to work with on projects like this?? Cathy, I love Reclaim paint!! Or Latex paint with a coat of primer first. Kathy, The chair looks amazing and so rustic. It would look amazing in a cottage as far as the paint goes. Not the best with wooden chairs that don’t have a good finish to them. I agree with Ms. Mike that spray painting might be a better option for you. Kathy, Kathy, Kathy. 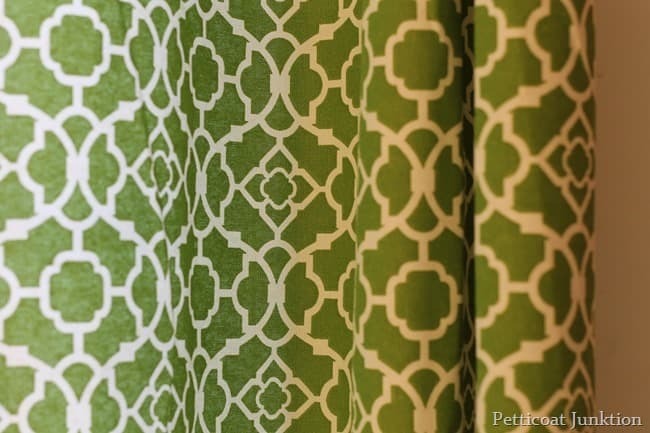 The color is wonderful and without a photo of the chairs against the curtains I couldn’t tell whether the color was good or not, but it is a color I would certainly use on walls or furniture. 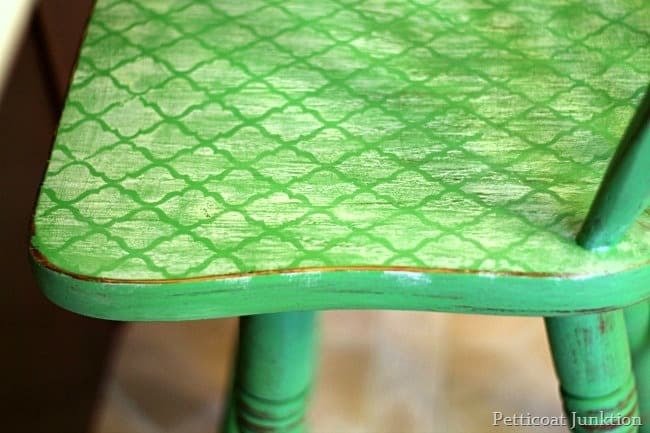 To get the color you want try DIY Showoffs chalk paint recipe. I don’t know if any would work on the metal. 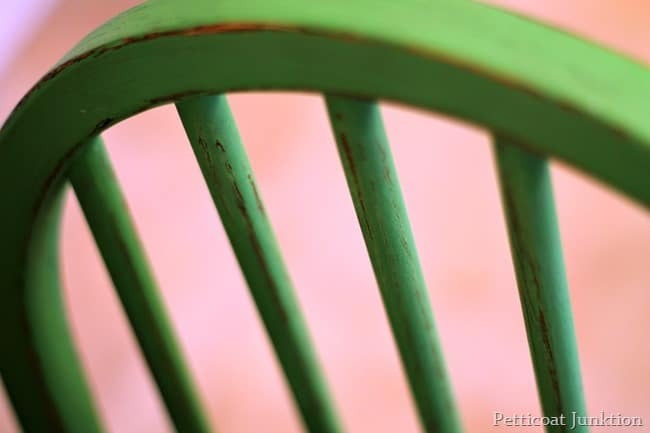 Why don’t you spray paint the metal white enamel and make it an attractive detail and not distress the chair so much? I agree with Debbie, this time you distressed too much with the dark brown finish underneath. You have a great day. I love the color and what you did to the stools. I love this shade of green. I appreciate your honest evaluation on this paint- I’ve been wanting to try it and it’s good to know that it doesn’t work well on metal. I follow your web site all the time and really love the work that you do, you have also been very helpful in answering many questions that I have as I am a newbe to painting and distressing. I love all the old furniture (antique/vintage) and really enjoy working on them. I have to tell you that this time on the stools I think they look a little to dirty almost like they need to be (refreshed if you will). I like the color and the stencil. I feel bad telling you this as your work is really nice. Thanks for the honesty Debra. I agree with you totally on the bar stools! I want all of my readers to give their honest opinion about my projects. As long as the comments are presented in a constructive way, I’m fine with them! !